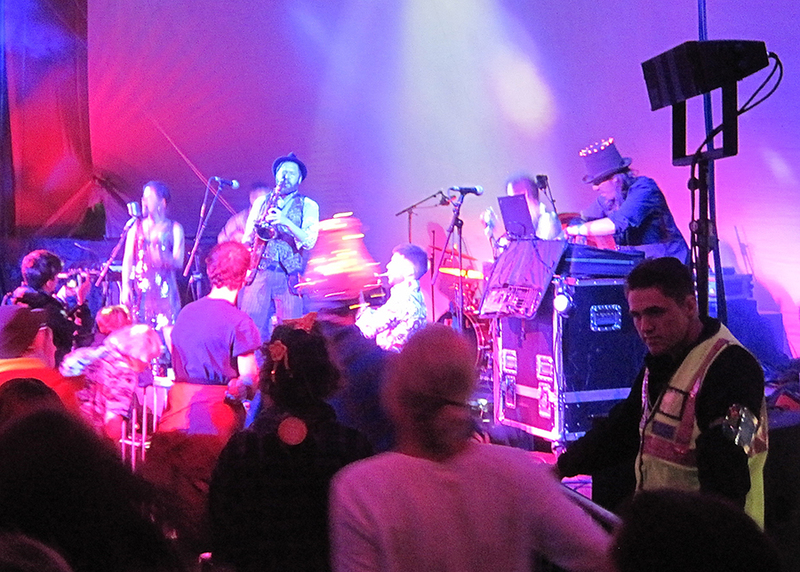 I have been to many a festival in my life, but strangely never managed to visit WOMAD until this past weekend (27. – 30. July 2017). 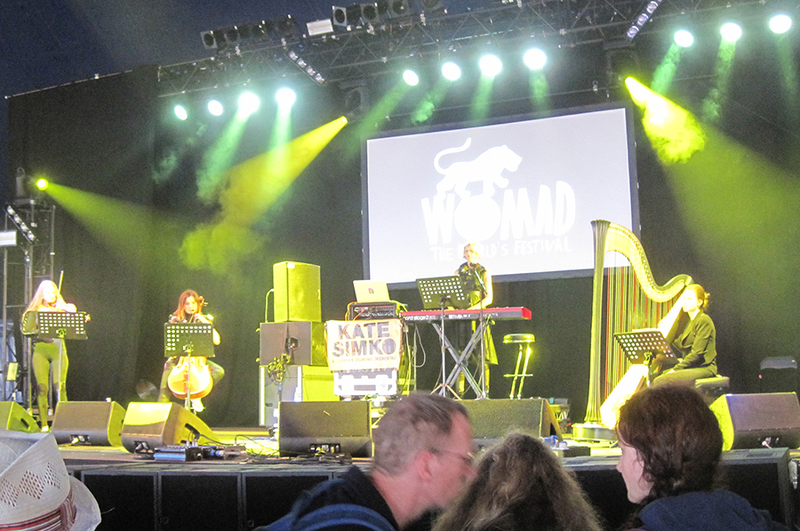 Of course WOMAD has always been one to go to and I don’t know why I’ve never managed before. It certainly wasn’t their reputation or the choice music. This is a festival for everybody. Comparing it with the big UK-festivals the WOMAD crowd were not all totally wasted for the whole weekend nevertheless the mood was extremely friendly! Even the torrential rain on the Saturday evening didn’t change that. 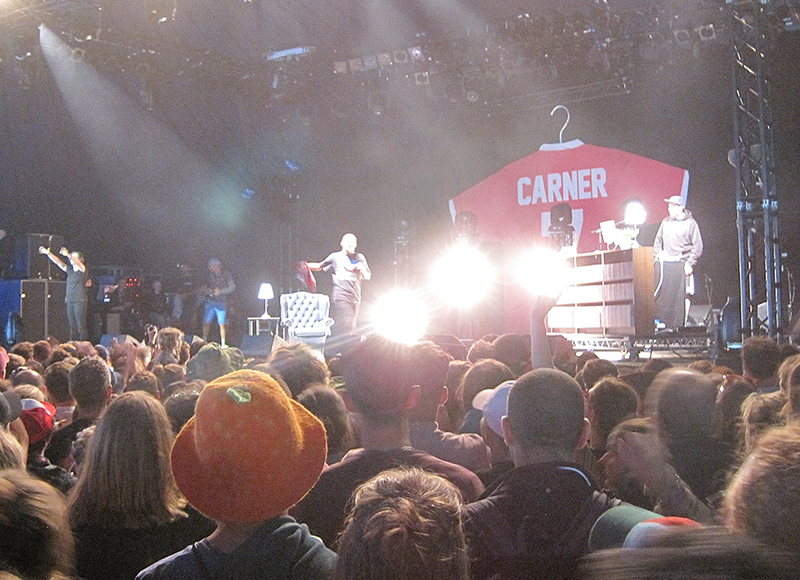 Hats off to everyone who endured the wet – I guess the good music helped! What really surprised me was how nice the security staff were, too. I have had festivals where you were treated as “the enemy” and security opened tents and summoned up festival goers like some totalitarian police force. Not at WOMAD! Staff couldn’t have been friendlier and it’s those seemingly small things like a smile and a joke that add up to a festival that is truly great. I also like the fact that the festival concentrates on Music, us being timbageek and all, rather than visuals and the abundance of big screens televising what’s happening on stage. It was music and it really made me – simply happy. I found myself listening with eyes closed quite a few times over the weekend. The programming worked quite well personally speaking too and most of the artists I wanted to see played at different times and stages. The “arena” area wasn’t too big, which made it easy enough to walk between stages and tents and not miss any of the bands/performers. At the bigger festivals it’s often a case of either seeing this or that, not this and that, because the stages might be too far away from each other. So here’s the real low down on the bands and artists I was honoured to see. First let me set your expectations: I am not someone who knows a lot of different bands or music performers. I know the ones I know, well and I have a broad taste in Music. As a musician myself I have a classical background and through this background I got into Prog-Rock in the 70’s and 80’s, followed by just Rock, than Jazz, than everything electronic followed by a few select Jazz musicians. The taste in electronic brought me to Chill-Out music and consequently the world music aspect of Chill-Out – later I also listened to folk and music from around the world so as this is WOMAD and world music it is on the table here that is the focus of this review. Listening to everyone on the bill on You Tube I came up with a list of 40 bands I wanted to see at the weekend. Of course it’s never possible to see everything and I had 6 or 7 bands I REALLY wanted to see and the others if I could. It’s also important at a festival to listen to some performers you don’t have on your “must-see” list, because you never know what you might discover. Thursday: was mainly speny setting up the tent, parking the car, getting organized or familiarized with the festival area and seeing who’s about. I was lucky enough to bump into some good old friends just by change and we started the festival on Thursday evening at Molly’s Bar. Molly’s Bar seemed to me like the “Bimble-Inn” (http://www.bimbleinn.com) of WOMAD. A stage with it’s own bar is always good and you don’t have to walk and find the next bar while listening to music. Although I think there are too many bands that use the term Orchestra in their name, this was actually a REAL Orchestra, or part of it. 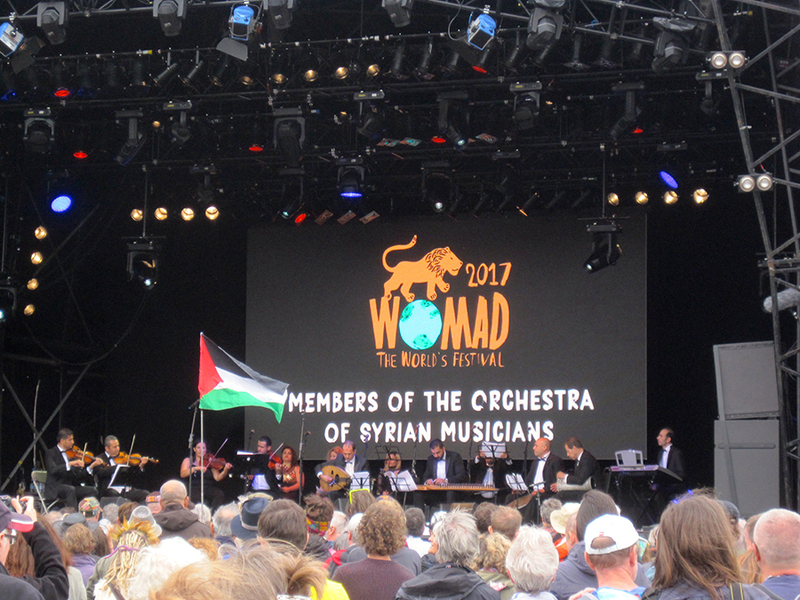 Despite all of the bad things going on in their country, the musicians of the orchestra seemed very happy to play and perform a mixture of middle Eastern rhythms and classical sounds. As the Band name says: “Members of… – not the full orchestra. One could only imagine the full sound of the complete orchestra and wishes that the terrible war in Syria will stop soon and people can get back to some sort of “normal” life, however much that is possible after a long war and in a place with little infrastructure left. Watching this performance made me a little bit sad and I tried not to think of the struggles the “Members of…” this orchestra have gone through in the past years. A very enjoyable gig and a great start to the festival. 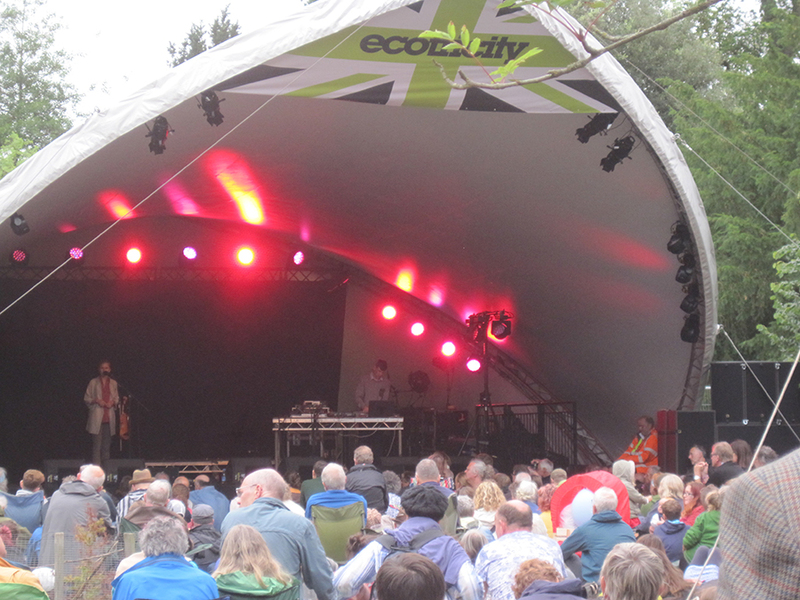 Maarja’s music was just right for the Ecotricity stage and the Friday afternoon. She’s a great violin player and knows how to use the Loop-pedal to her advantage. The soundscapes she has created together with Hendrik were very nice and mellow. But I really enjoyed her story telling. What a treat! I haven’t heard or known about Alsarah before and after reading the description in the festival program I decided to see this gig. I didn’t regret one minute of it. The three musicians and two vocalists created a magical set full of interesting new sounds and rhythms. Alsarahs voice is so great that there are no words (yet) to describe it. I wish that sometimes she would’ve sung in English and being from New York I somehow expected some English songs. This is a band whose album I will certainly buy. Goat were interesting to watch in their Goat-costumes. They were one of those bands that you stumble across at a festival. Hugely entertaining, even though the music wasn’t 100% to my taste…. But I did explain before, that my musical taste is somewhat different. Wow – Wow – Wow. Blue Lab Beats! I was totally blown away by them. Not only did they play in the Bowers & Wilkins Sound System Tent, but these two boyz from London really managed to fuse Grime & Jazz to perfection. I assume the stage technology comprised of a drum machine programmed live and sync’ed to a Looper into which they recorded bass, guitars and keyboards and playing another Live track on top of all that. This is really what it’s like when great musicianship meets great programming talent. I can’t praise these guys enough. We ended up in Mollys Bar again later in the evening on the Friday and stumbled across After-Hours. Here is what it says on the tin: The After Hours Electro Swing Band are a 21st century anomaly – a collective of loveable rogues hell bent on redefining live dance music. And I couldn’t agree more. Quite the right music to dance along to. Great entertainment! After After Hours I saw a little bit of Xåos, but found it too slow and chilled for the time of day. I had just been dancing to some swing beats and was ready for more of the same or similar. I didn’t stay long, but what I’ve heard sounded great and I would’ve loved to have seen these guys on the Sunday afternoon. Howie B. nailed it! Of course you don’t come to WOMAD to watch a DJ, but for the time of day it was acceptable and one or the other leg was swung. 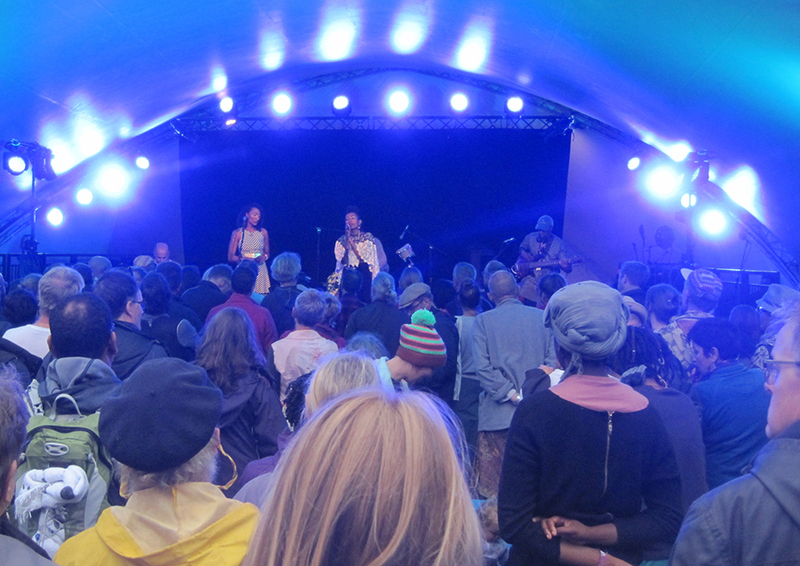 This was the time when I noticed the rain had started and I was happy to be back in the Bowers & Wilkins tent! I was a little skeptical about Bill Laurance at first, having seen Snarky Puppy at the London Jazz festival and being a bit disappointed with them I hoped that Bill would be better on his own. AND – he was!! Of course I was a bit wet and cold at this time and didn’t stay to watch the whole set, but my tent was close enough to the Siam-Tent so that I was able to hear the whole set. And I can’t praise this music enough – another album on the list to buy! I have met Atau at Goldsmiths’ University in London and was looking forward to see hearing his performance of muscle controlled sound. Quite a futuristic concept, but on the other hand quite an old idea, too and probably similar to what the Therein presented 100 years ago. The music I performed was also released on a CD recently. The CD was published in partnership with The Wire magazine, and will be available this autumn for order from Matthew Herbert’s label, Accidental Records, and available for streaming on Spotify. 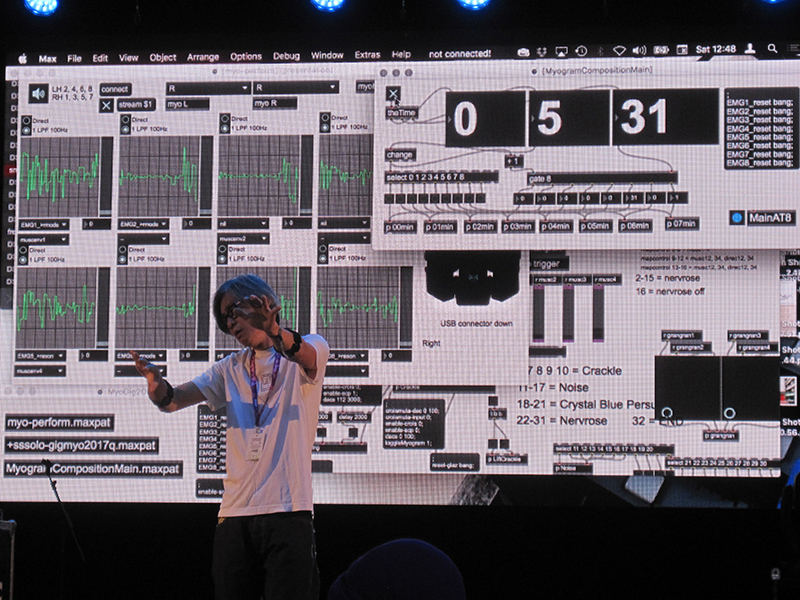 Atau used the Myo armbands and MaxMSP software, with which he programmed his compositions. Having 8 patches on each arm (i.e. giving you a total of 16 controllers, for those of you who understand MIDI: 16 Channels can control 16 different aspects of the sound – and I won’t go into further detail and bore you with technical speak…). Quite interesting to watch and I hope to see more of this in the future. Email info@timbageek.com if you do want more on this. 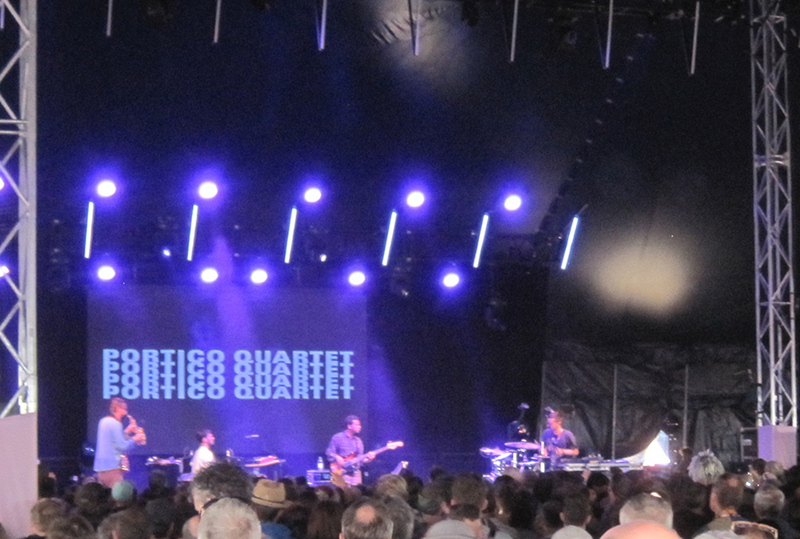 Portico Quartet was the Headliner at this festival – for me! 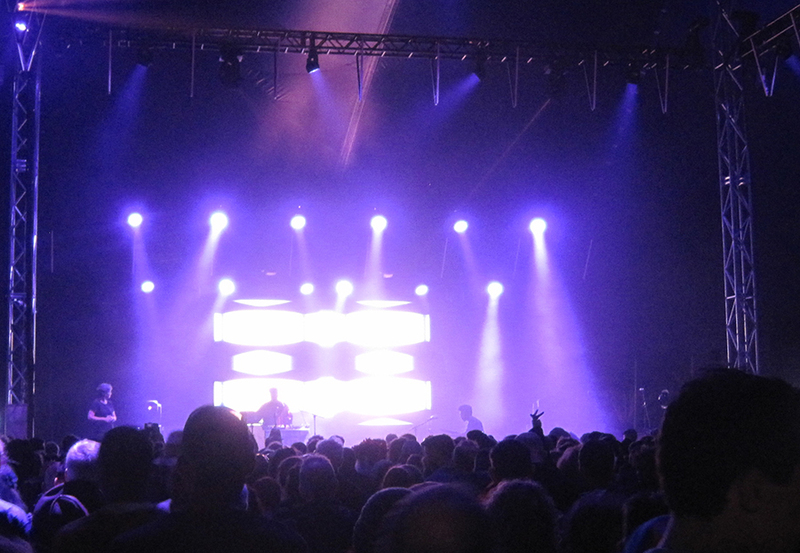 Their music is right “up my street” and the fact that this was a Quadrophonic concert in the brilliant Bowers & Wilkins Sound System Tent made this gig very special. I find the Portico Quartet equally fascinating as I did find “The Cinematic Orchestra” in the early 2000’s. However these four guys are great musicians and know how to create great atmospheres and soundscapes. 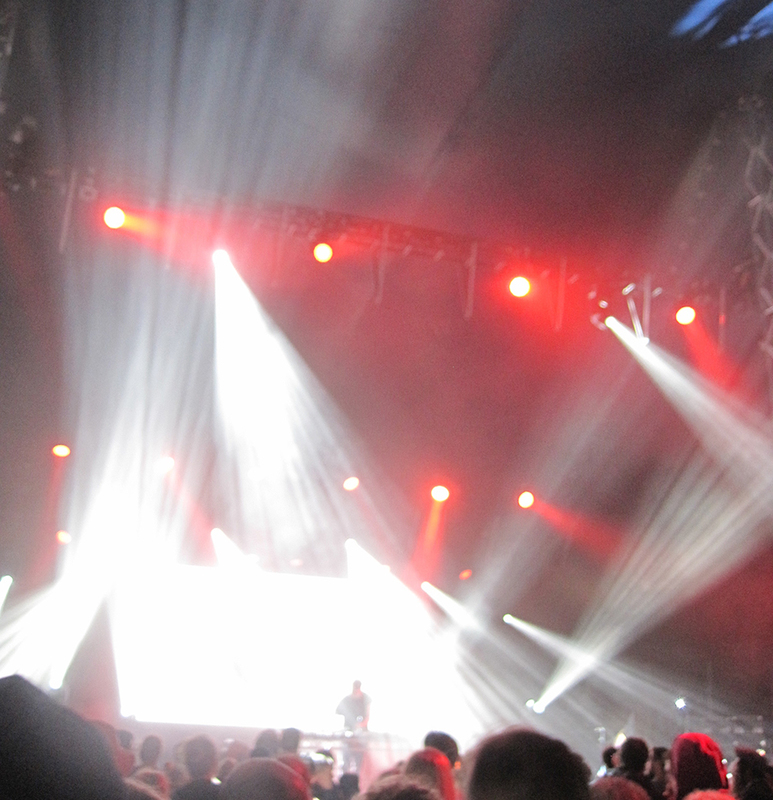 I found myself mostly standing with my eyes closed in the center of the tent to enjoy the Quadra-Sound and the great performance. I can’t wait for the new album to come out! I had briefly met Loyle backstage and was just baffled about the Living-room furniture he brought onto the stage. Quite a nice stage design. I just didn’t agree with the Arsenal-style football shirt, but that’s a different matter. Again I was presented with some great music and a brilliant set of electro soundscapes – fused with live video animation. The only thing I would’ve liked to see, too was a view of his desk and what kind of devices he used. I felt a bit like at a Kraftwerk concert: You see that they are doing something on their desks, but what exactly it is you don’t know. However, the output is what counts and it was very good. Another album on the list to buy! Well, my parents had been to Damascus some years ago and showed me pictures of the Dervishes. 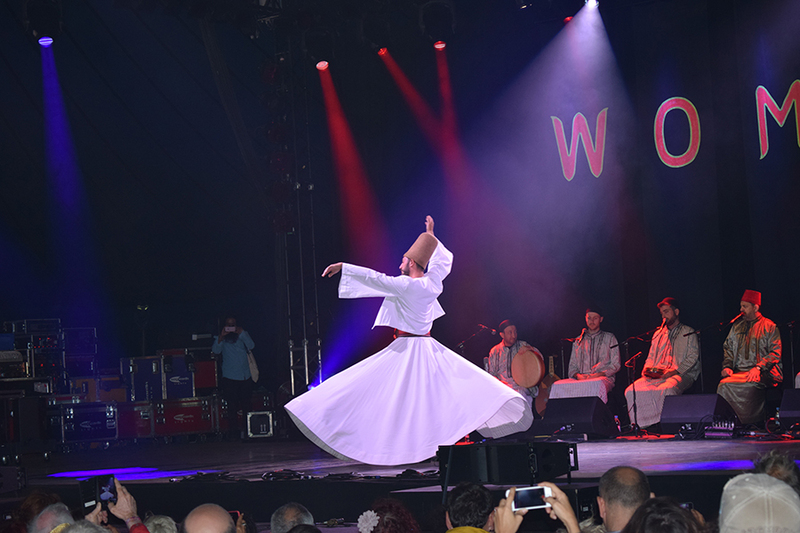 Seeing photos doesn’t nearly represent a LIVE Dervish as seen during this set. Mind-blowing! And the singing: Some great harmonies and very powerful voices. I don’t know what they were singing about and as a very non-religious man, perhaps it’s better that I couldn’t understand the words. I have only heard Benjamin on the Sinead O’Connor track Empire from the 90’s, but I instantly recognized his voice when he came on stage. What a poet, what a great musical performance. The Revolutionary Minds provided a great dub infused set and Benjamin’s words spoke my mind. Glad to have seen this! This must be London’s smallest orchestra. One Violin, one Cello and one Harp. I mentioned earlier that the use of the term Orchestra is slightly over-used these days and I don’t understand why bands want to call themselves Orchestra? Have they never seen a classical concert performed by an actual one? Well perhaps it is fashionable or helps record-sales to have that addition to a name. With this show at the festival I was slightly disappointed. Probably, because I did expect more due to the name. However the music was performed very well and made for some pleasurable listening. But for my taste the backing tracks and beat programming lacked some imagination and finesse. I would’ve liked to see a drummer and definitely a vocalist during this set. South-Africa’s finest (vocal performance) I would say. Again incredible voices and harmonies, which made any instrumental addition superfluous. And after all this I ate some great Tibetan food, packed my still wet tent and clothes in the car and made my way back to London. Taking with me many happy memories and a good mood, which I hope will last for some time to come. LOOKING FORWARD TO WOMAD 2018!